Delhi High Court Today adjourned the bail application filed by Kanhaiya Kumar for Tomorrow. Delhi Police opposed the bail application in the Court. Justice Pratibha Rani asked the Delhi police to file the status. The entry to the courtroom was restricted to lawyers involved in the case, family members and media persons. “Delhi Police submitted a report in high Court on Kanhaiya. 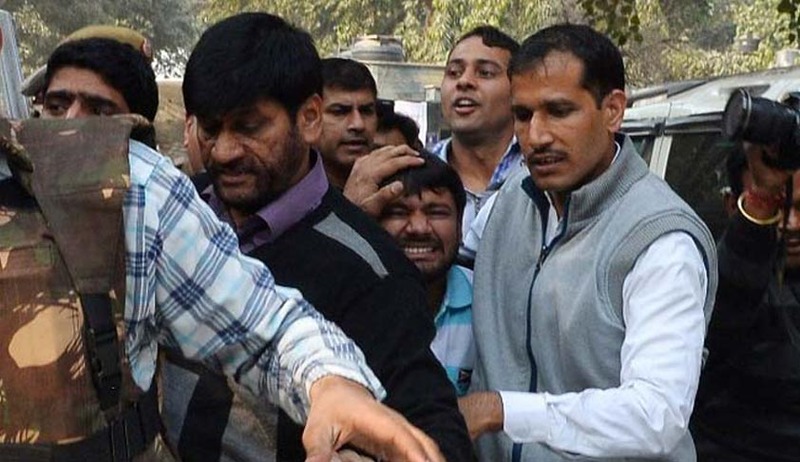 The report claims that Kanhaiya shouted anti-India slogans during an event at JNU campus. This is based on the video footage taken from a private television channel. Earlier Delhi Lt Governor has asked Delhi Government standing Council Rahul Mehra not to appear in the Case. He appointed Four lawyers to appear for Delhi Police in this Case. Meanwhile Delhi high Court agreed to hear a petition filed by a law student seeking directions to Delhi Police to enter JNU & arrest Umar Khalid & others accused in this Case. In the bail plea, Mr. Kumar contended that he has been “falsely implicated” and booked under charges of sedition. He has denied raising any anti-national slogans during the event organized at the Jawaharlal Nehru University. Mr. Kumar’s lawyers had rushed to the High Court, after a Division Bench of the Supreme Court refusedto entertain his bail application, directing him to file the application before Delhi High Court with proper amendments. He had moved the Supreme Court under Article 32 of the Constitution of India, citing ‘extraordinary circumstances’ prevailing in the Patiala House Court. Mr. Kumar has been charged with sedition and criminal conspiracy over his comments on the hanging of Parliament attack convict Afzal Guru. On 11.2.2016 FIR No. 110/2016, under Sections 124A/120B of the Indian Penal Code was registered against Kanhaiya Kumar, and other unknown persons by Delhi Police. On the same day, he was arrested. On 12.02.2016, he was remanded to police custody for 3 days, by the order of Shri Loveleen, Metropolitan Magistrate, Patiala House Courts, Delhi.